I am pleased to say that Manor Press Ltd. has had a great year, we have met some wonderful new customers, purchased some new toys to play with (important pieces of equipment to improve production and quality levels, if Christine's reading this). We have also upgraded and improved our old website so that it's more compatible for phone & tablet users, has better product descriptions and images and we will be introducing a select range products that you will be able to add custom print to. We say goodbye to Gary, I'd like to thank all of our customers for their kind comments and support over the past few years while my dad has battled with cancer. Sadly Gary passed away on the 31st July 2015. I would like to take this time to reassure you that I will be following in my fathers footsteps and Manor Press will be run with the same love and ambition that he started his business with. Manor Press was established in 1931 by Walter Woodward, it was originally located on City Road, Manor, Sheffield where the old Kwik Fit garage used to be. After many years of hard work and growth Walter moved Manor Press to the larger premises of the Manor Estate Social Clubs basement, where he was later joined by his wife and son. As Walter slowed down and prepared for retirement Ken (Walters son), took up the reins with his mum and wife (Jenny). In Walters day, life as a printer was hard and time consuming even though Walter invested in the latest machinery, two Heidelberg letterpress machines (still used over 60 years later) a page of text would have had to be set out by hand, this could take days to do. It was after Ken took over that things started to change with the investment of a new lithographic press. The new technology of the litho press helped Ken reduce the cost of print to his customers and orders could be processed twice as fast. Ken still used the old technology as the numbering and perforating capabilities of the letterpress are far greater than a lot of machines today. When Ken & Jenny's rein of Manor Press was drawing to a close and with no family to hand Manor Press down to they decided to sell, but Ken always wanted it to go to another family, someone that would show his customers, his friends the same care and passion his family had. This is where we came in, Gary (dad), Christine (mum) and Martin (son). 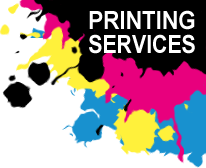 We already owned our own small yet successful printing company called Alphabet Designs and were looking at ways we could improve and grow our business when we saw an advert for the sale of Manor Press. After a quick discussion we jumped at the idea of merging the two businesses together With Alphabet Designs modern equipment and Gary’s printing knowledge merging with Manor Press’ equipment and unusual product range would give us everything we wanted. When we took over we quickly got to grips with our new venture and began to improve techniques and production methods. Our one major draw back from the merge was trying to fit all of our equipment into one building. Even though Manor press had larger premises, was in a more viable position and was well known in the area it was too cold, dirty and insecure to move our computers and digital press across. So we started looking for new premises so we could all work in the same building and one year later we found them and were relocating everything into one building. We have now been in our new premises for around 10 years and after 80 years Manor Press is still going strong. We are still investing in the latest technology and improving our production methods as well as product range and hope to do so for another 80 years. The photos to your right show Manor Press as it was in the basement of the Manor Estate SC. The old hand fed platen that Ken's mum used to run when she was in her eighties, the original event posters on the walls dating back to the 1970's (which was also the last time it was painted) and the old handmade typesetting furniture.